Today at its ‘Inside Search’ event, Google announced several new features, including desktop support for voice search and a new mobile interface. 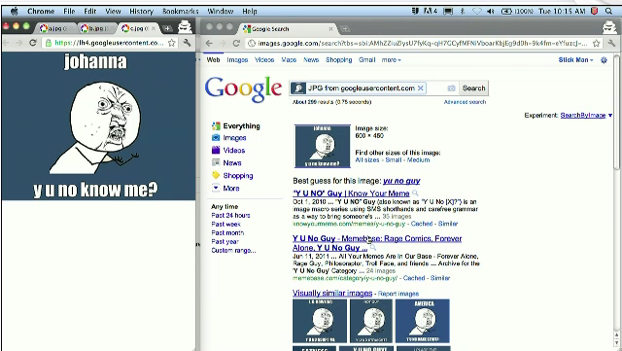 And they’ve just shown off a new way to actually create queries: Google Search By Image. I haven’t gotten to try it out yet, but the feature looks quite nifty. Drag an image from your desktop into the search box, and Google will attempt to identify what it is and bring up relevant results. Google showed how this could be used to identify a mountain in a snapshot, or the origins of an icon. The final example: a JPG of the Y U NO guy, which brought up results from Know Your Meme and a variety of other sites explaining the origin of the meme. Google says that the technology is similar to Google Goggles for mobile, but refined for the desktop experience. The feature will roll out on images.google.com over the next few days. When you see a camera icon in the search box, that means you can use it.